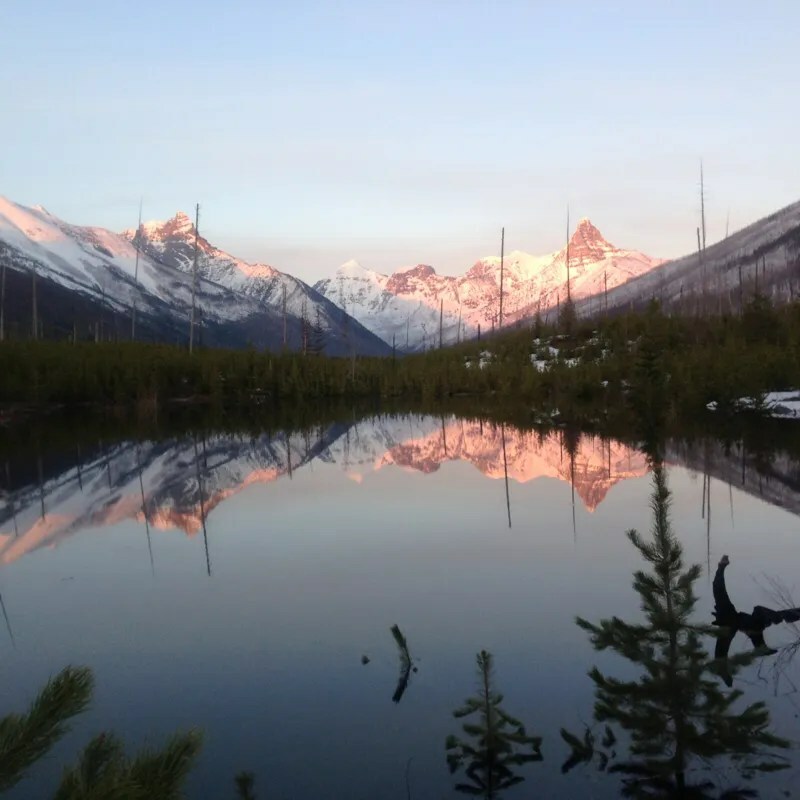 Just as they stick up into the sky, certain peaks stick in the imagination. Perhaps they’re aesthetic, or rigorous, or feature in an epic tale told around the dinner table. 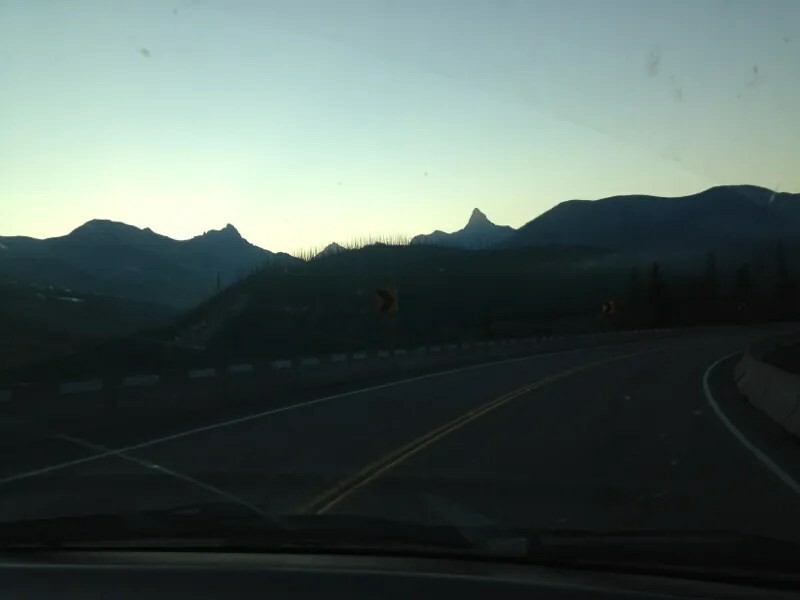 Rearing heavenwards in the southeast corner of Glacier, Mt. Saint Nicholas certainly fits the bill on all three. Not only is the thumb distinguishable from everything nearby, it’s sort of a family tradition: my grandfather and several uncles have been to the summit. I’ve heard the story of how the first move requires the leader to stand on someone’s shoulders to start the moves at the family dinner table several times, and with such a legacy to follow, it had to happen sometime. 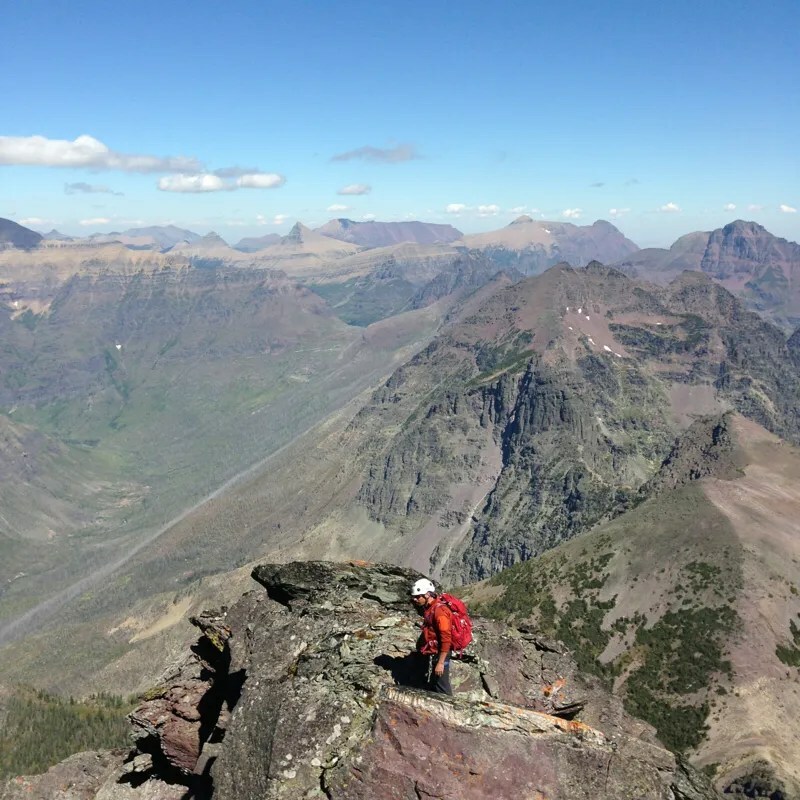 Most mountaineers that play in Glacier have either climbed St. Nick or say they want to. Earlier this summer, some friends had suggested we make it happen over Labor Day weekend. Having not heard much from them in the week leading up, I got a phone call from Greg Fortin while painting a picket fence for Dave Boye. The weather looked good. We’d have our window. Did I want to go? I’d counted on the week to take care of some projects, including finishing the fence. Thankfully (for my predicament), Dave was turned around by poor timing on St. Nick earlier this year. So if it didn’t happen on time because of a climb, I figured he’d understand. And at six the next morning, it was on. St. Nick is on the right. 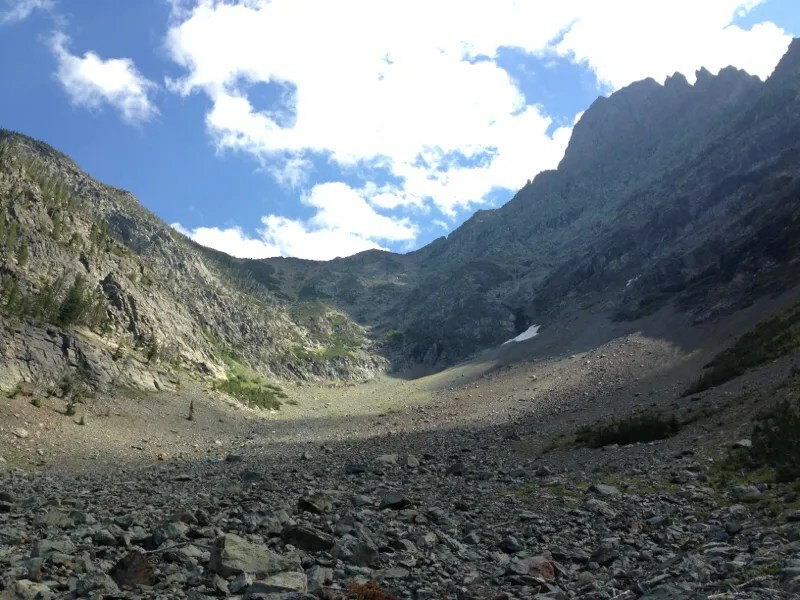 Much like our soggy trip into Stimson this spring, St. Nick would require crossing both the Middle Fork and Coal Creek (twice) on the approach. Instead of the fiasco of wandering through the woods with a pack raft in tow, we were lucky to be able to ford. Greg takes to the chilly morning waters. Amazing what a few months of melting and drainage can do. The place were Greg is standing was under ten feet of spring runoff when I last skinned by it. The trail disappeared into the chilly pond, only to remerge on the other side. Funny that it leaves a grassy meadow for later in the year. Undesignated permit in hand (or, more accurately, in pack), we planned to camp in the saddle north of the peak that first night. After an early start the next day, we’d climb, summit, and head back out. At least that was the plan. Before we could even start the technical climbing that gives St. Nick the mystique to back up its grandeur, an 11 mile, 5000ft approach was on the menu. As we walked in, I pondered the newness of the situation. 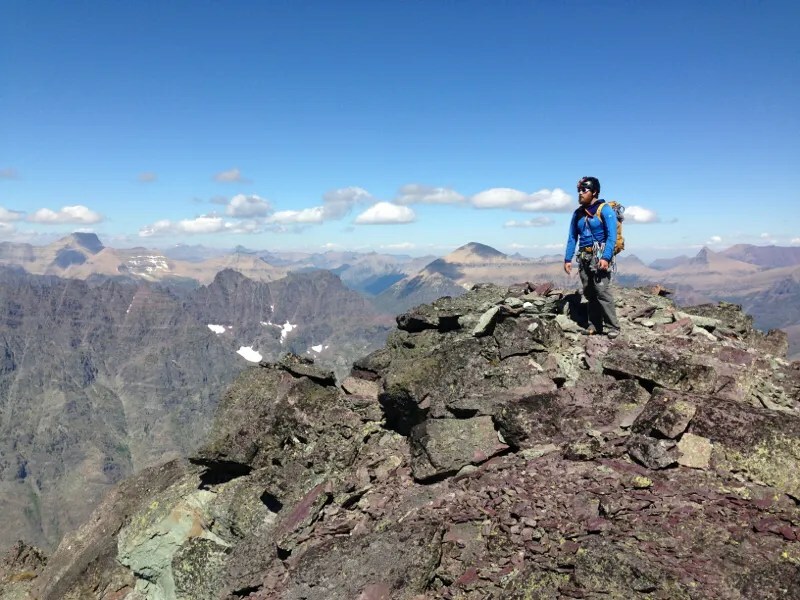 Though I’ve been doing plenty of climbing this season, “climbing” in Glacier usually means a decent approach, 3K-6K feet of scree, bushwhacking, and a bit of scrambling to keep the “climber” honest. 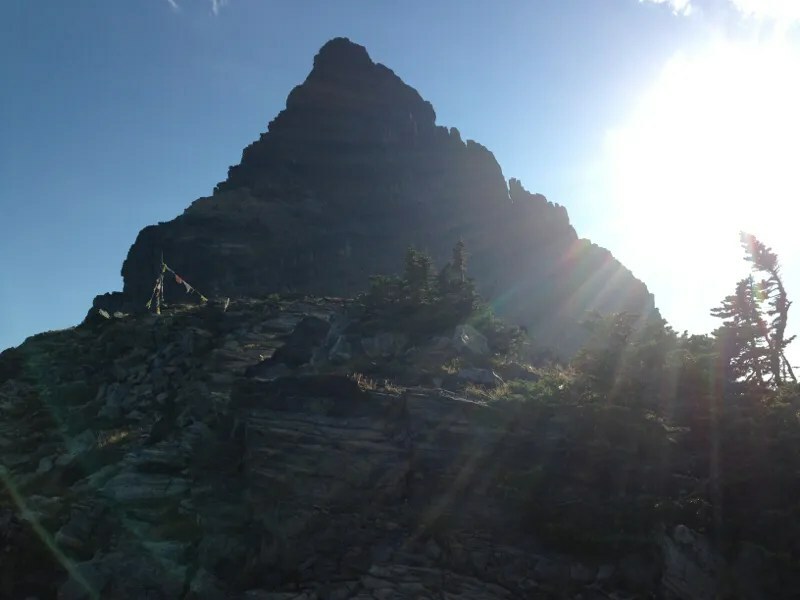 I’d guess that there’s ten named peaks in Glacier that actually require technical rock work or glacier travel to reach. 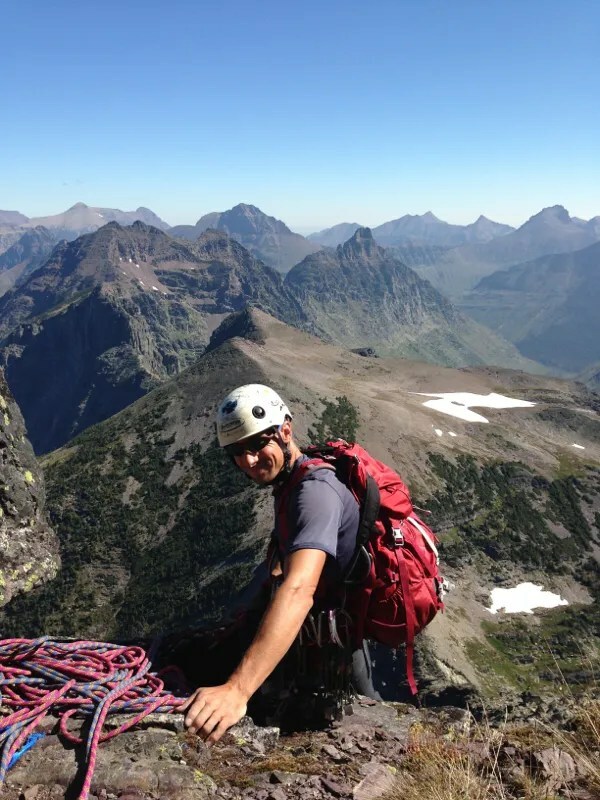 St. Nick is one of the few where the standard route involves multipitch alpine trad climbing. 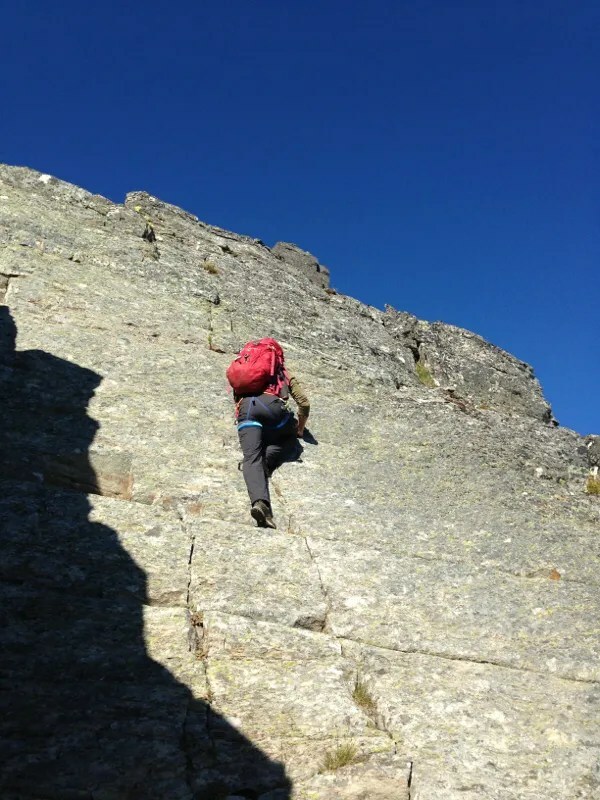 My cragging seldom wanders into the multi pitch realm, and my trad leading experience was precisely zilch. Offering to carry half of the rack alongside one of the ropes was a partial token of thanks to all the leading that Greg would be doing. However, after looking at Mt. Sir Donald on Rogers Pass the previous weekend, I needed to see if alpine rock was really something I could do. And as we wandered down the valley through the wet morning grass, I knew that if it proved too much, we’d bail and come back when I was ready. 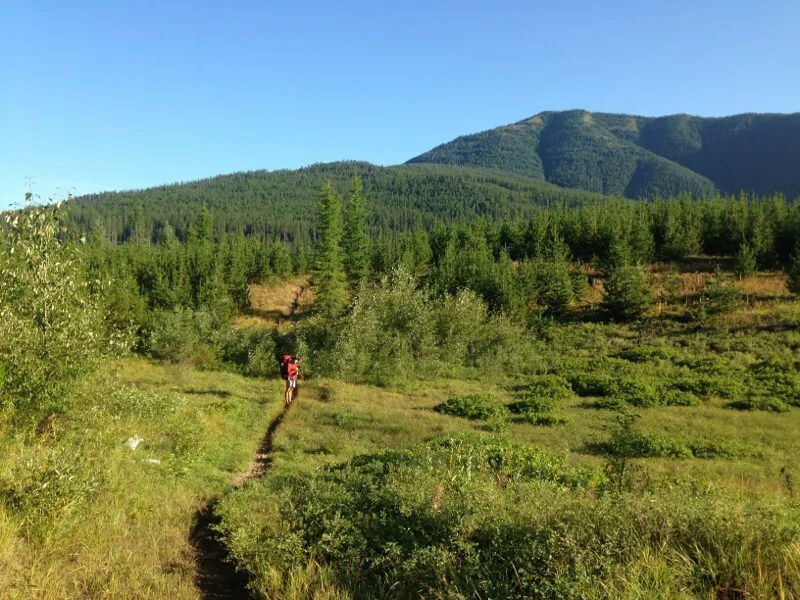 Our approach took us about three miles past the Coal Creek backcountry campground. From there, we dropped off the trail, and went straight into the Fire Swamp. Though the fire didn’t seem particularly active, I kept a watchful eye out for R.O.U.Ses and barely pulled Greg from some Lightning Sand. Finally pushing up the other bank and out of the devil’s club was a joy. 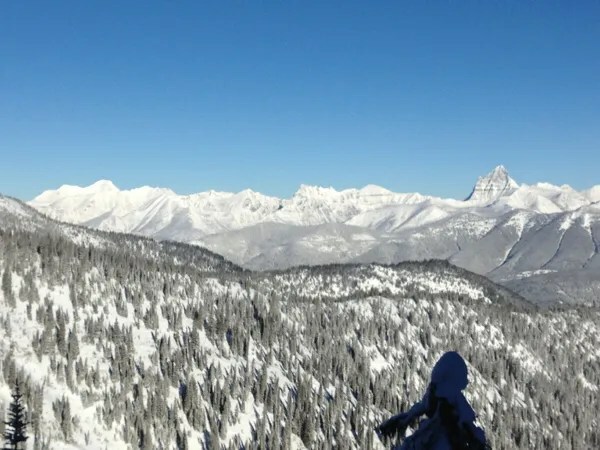 It turns out that we were off route–a better plan is to follow the ridge top just to the west of the main stream draining the NW bowl of St. Nick. Most of the game go there. 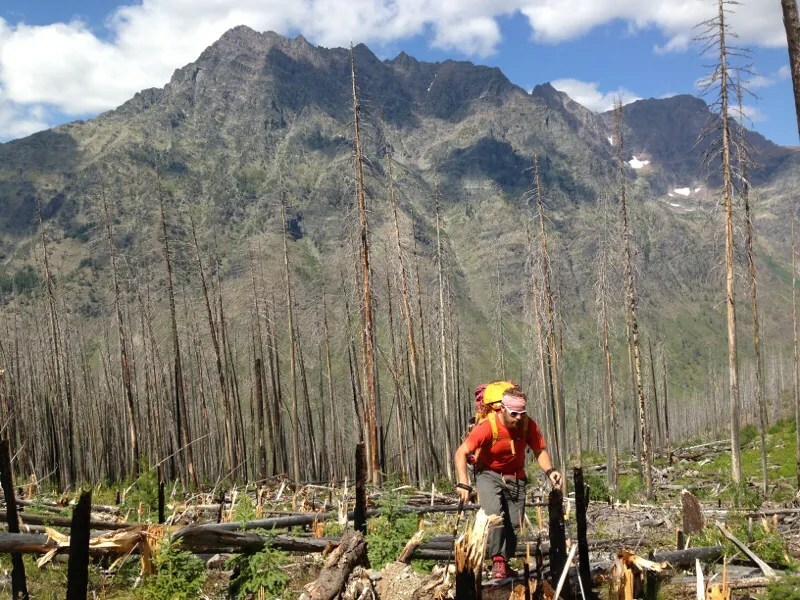 Since it’s a ridge, the deadfall are stacked right on the ground instead of being lifted in the air–thanks to Greg for finding it on our way out. Instead, we forged ahead. And were well rewarded for our efforts. 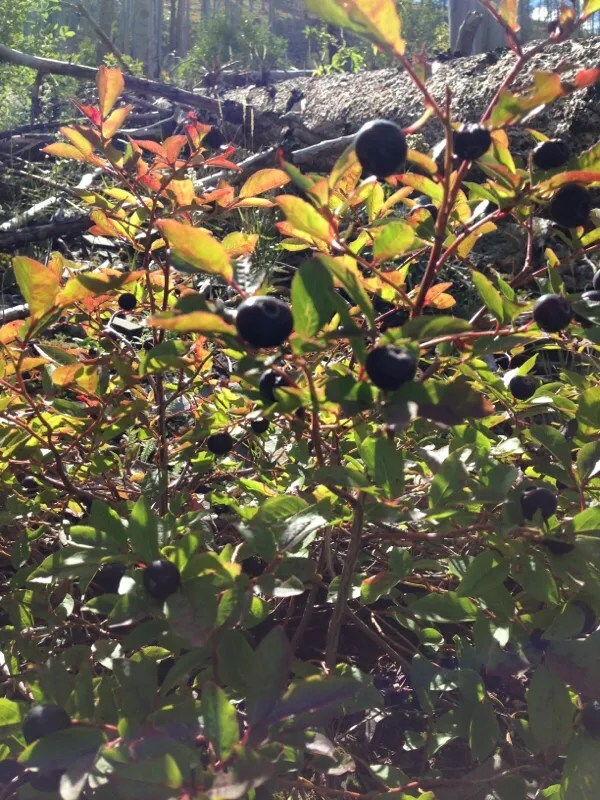 Not R.O.U.Ses, but H.O.U.Ses–Huckleberries Of Unusual Size. Some friends have been calling the bushes “hucklecherries” this season, and it fits. Most of the ones we found were of the gargantuan variety–which slowed our progress, but not in a frustrating way. Fire whipped through this area some years ago. 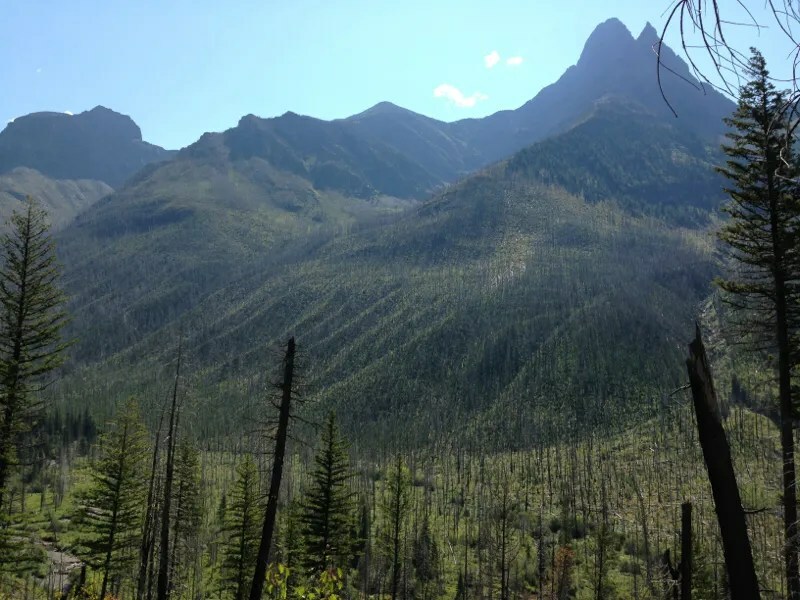 Many of the trees in the bowl we ascended were completely torched, which changed the avalanche dynamics of those forested slopes. Slides had come through, leveling whole swaths of trees in the exact same direction, cutting right through groves that probably hadn’t seen such activity for quite a while. Then the forest ended, and we were into a large rock field decidedly lacking in delicious fruit bushes. 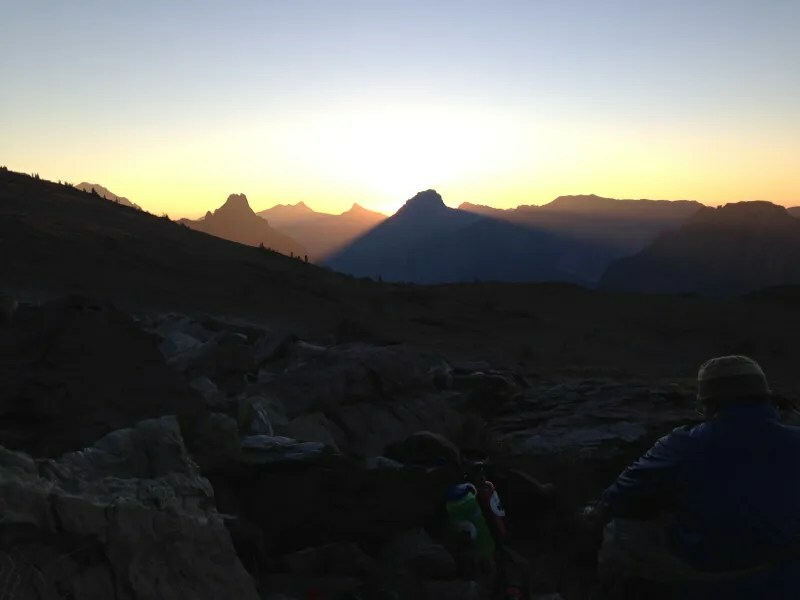 Near the top, I filtered four liters and stuffed them into my much heavier pack–we guessed that the saddle campsite wouldn’t have water, and were kind of right. Impressively, the last thousand feet were a frustrating bit of scree work, alternated with slippery rocks and route finding up the chutes. I would have been lost on the way down had Greg not known the way, so I’d mark it well on the way up. 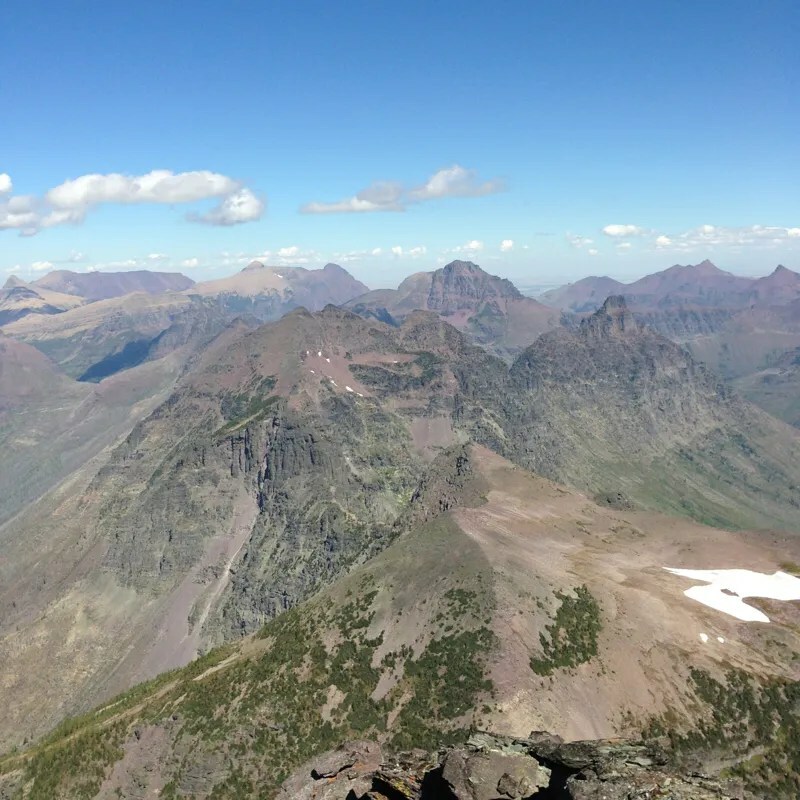 I was expecting to be way high on a ridge with an epic view down into a valley–the lake and plateau that instead showed up were even more interesting. Looking south. 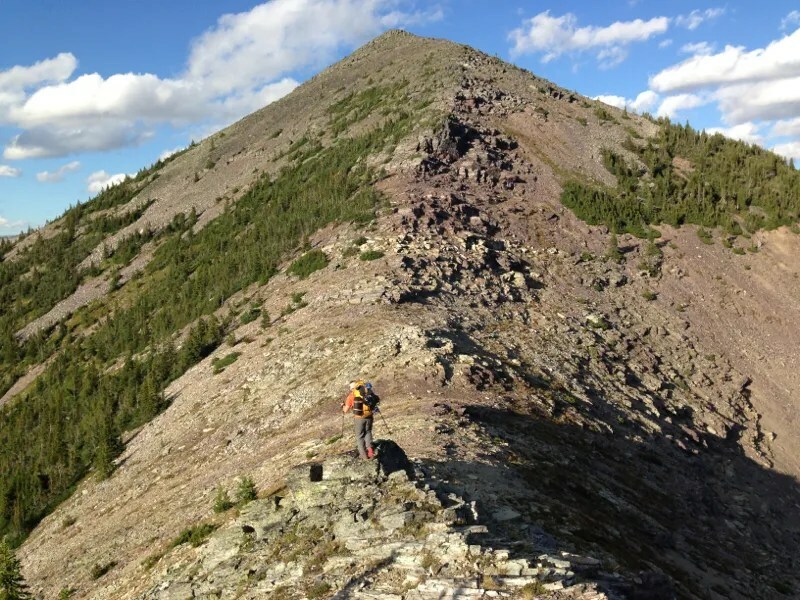 Central high point is an unnamed peak north of Church Butte, and the craggy ridge is Salvage Mountain. Once we’d ate dinner, Greg went off to the snowfields below the pass to get some more water. He took a wander on this way back up to see the plateau behind the ridge in the above photo, and came back quite excited about some grassy patches of flat turf that seemed much more protected than the windy, rocky options in the saddle. Greg headed out to the better spot. Of course, it was a pretty rough spot, with the blasé views you generally get around here. A quick trip up to the ridge for sunset left us contemplating the last thousand feet or so–it certainly looked impressive. I totally relish sleeping outside, but some places carry the beary bogeyman with them. Brilliant stars shown down. The Milky Way splashed across the sky, changing positions every time I woke up. An unusual amount of shooting stars skittered their way through the atmosphere. Right around three AM, I looked over to see greenish Northern Lights decorating the north horizon. 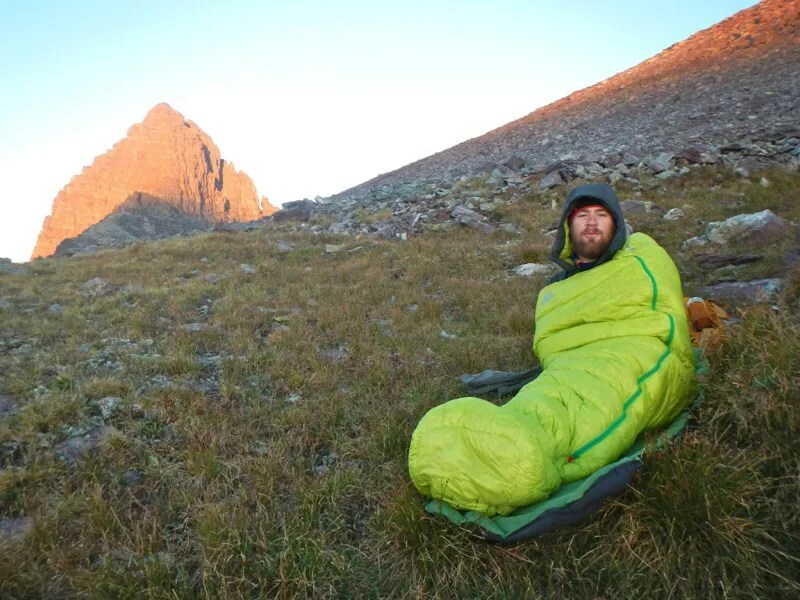 And through it all, I remained subtly convinced that the rustling of my sleeping bag in the breeze was the sound of a bear crunching through scree. Sort of a ridiculous thing to worry about, because even if it was, what was there to do? Nevertheless, it was there. And I totally slept through most of Greg yelling at me to get up for the sunrise. But not all of it. And Greg caught me looking really spiffy. The snow Greg put in our water bottles the night before had melted some. After a hurried breakfast and repack, we were off to the races. 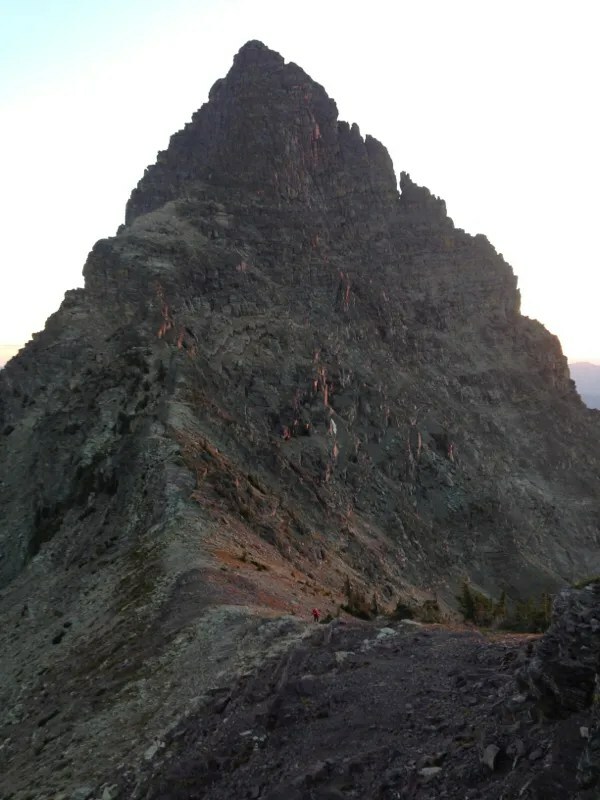 There’s quite a bit of gain from the saddle to the Great Notch, where the rope work starts, and we definitely had our share of route finding difficulties. Last time Greg was here, eight inches of snow fell while he was trying to get to the mountain, and he had to fix extensive portions of line to get his team out safely on the slippery rock. As we climbed up, he recognized a few pieces of sling and cordelette that he’d left in those heinous conditions. 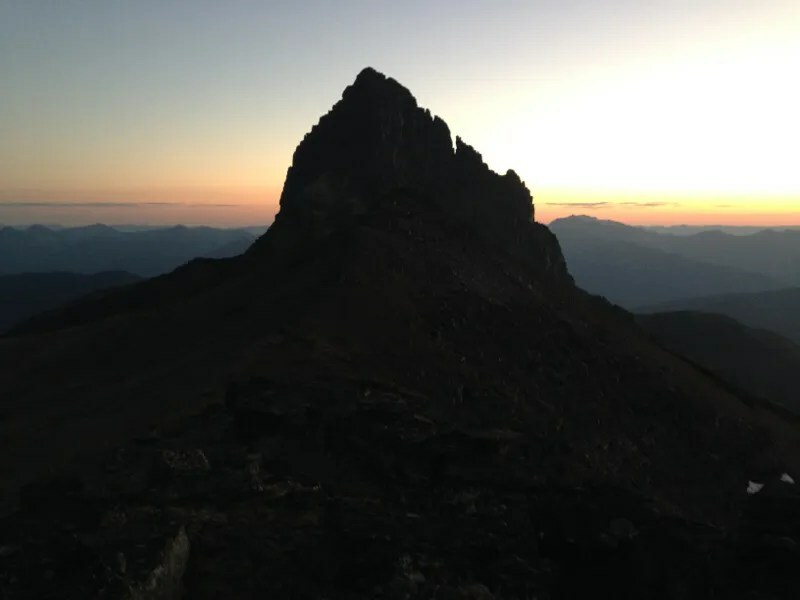 There’s a bit of info available on the Summitpost page for different routes, but not much in the way of actual explanation for the Northeast Ridge. Anytime an obstacle is reached on the ridge approaching the Notch, we detoured to the south side, staying pretty high on each detour. There’s a couple bits of stiff class 3 en route. But pretty soon, you pop out on the little summit to the north of the Great Notch, and it’s party time. 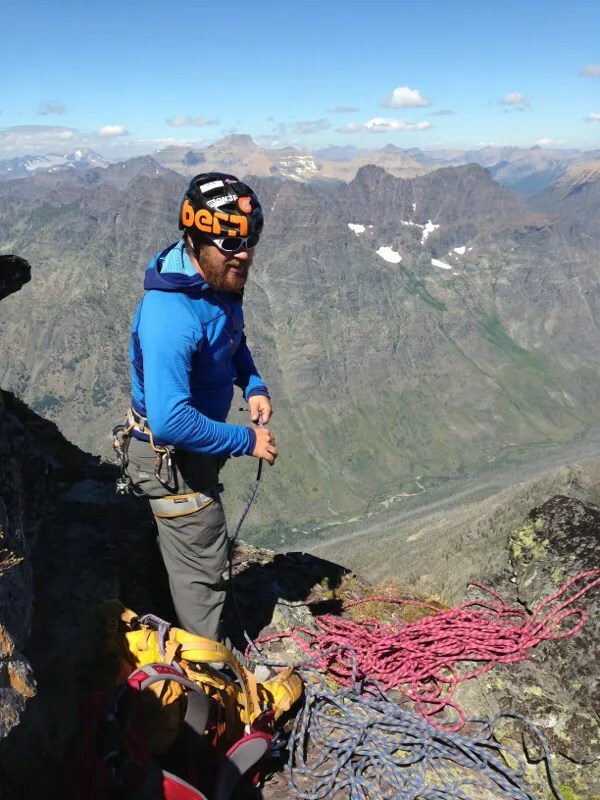 Just before, take a look up the cliffs, and if the slings are still there, it’s easy to spot the first two belay stations–boulders with nice ledges and good spacing. The vaunted first move is, at worst, a 5.8 overhang with poor feet. A small stack of rocks helped us, but once you slug through a couple hard moves on big handholds, it’s way easier. 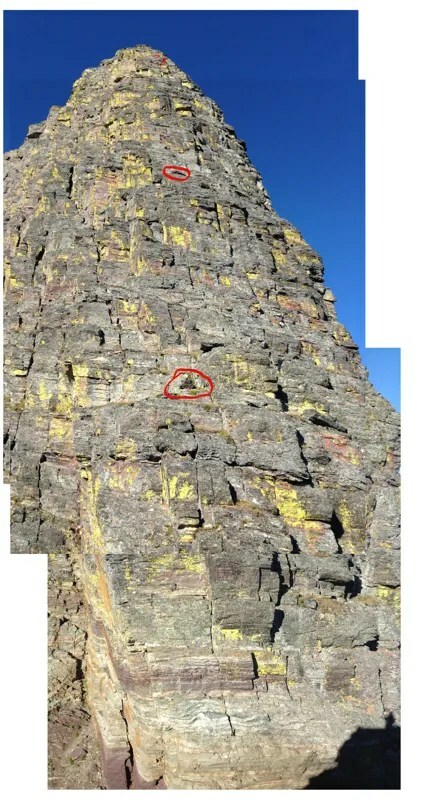 I circled the belay stations in the composite photo below, and what I think is the third belay ledge. 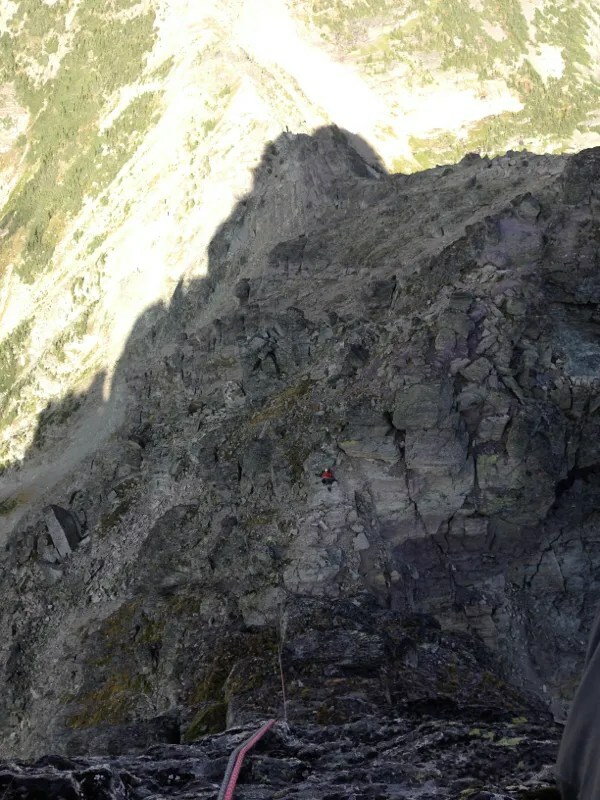 It’s probably not as far as it looks, but that third pitch was pretty long for us, and used most of a 70m rope. Anchor is another large boulder with slings. 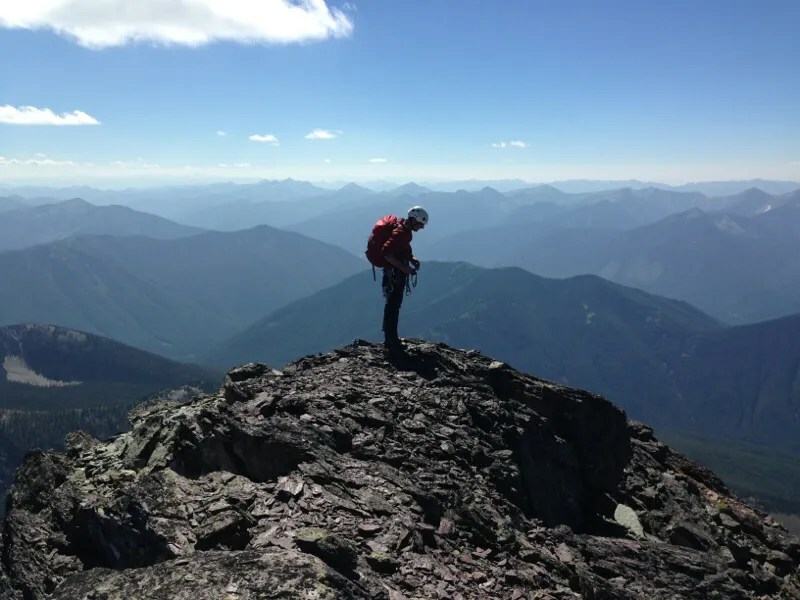 All of this climbing is directly on the spine of the ridge–no need to wander onto the faces. There’s a bit of curve to the thing, and even when it’s starting to level out more, there’s a bit of work left to do. To start the fourth pitch, detour not too far off onto the NW side of the ridge spine (several piton belays stations over here). We made the mistake of going towards the SE side, and that lead to thin, nasty 5.9 with rope drag and very few places to put in pro. This pitch was perhaps the steepest, most exposed climbing, hitting somewhere around 5.8 for most of where we were. I’d wager we took a harder line than necessary, and again, it was a boulder for an anchor. Fifth pitch was pretty quick, and we scrambled the last one to the summit (but did a single rappel back down it). Getting into the groove came easily. Greg was doing great lead work, and it was a pleasure to see the rope snaking out through my belay. 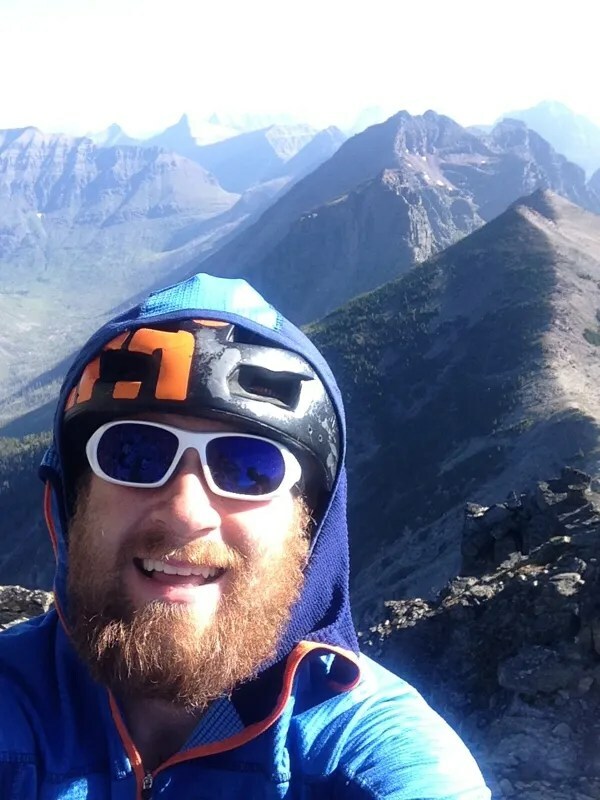 I wore my Mountain Equipment Eclipse hoodie all day as a thicker side of base layer, and it was perfect–warm enough for the windy belay, but great when the sun was shining down too. Especially using the hood as a sun shade. It wasn’t until the third pitch before I really realized how high up we were–as the photos show, it’s blocky and not totally vertical. Contrary to what I’d expected, the exposure was there, but not incapacitating. I had a solid belay in Greg, and though I didn’t weight the rope once, I think that confidence allowed me to pull out the microscope. Focus on the moves. Be right there, right now. One hand and foot at a time, moving steadily upward. And that’s the beauty of something so mentally involving as climbing up rocks–I totally forgot about bank accounts, frustrations, and even my own name. It’s the sort of trance that I get while skiing down something, but on the uphill. Greg at the top of the third pitch. Twenty seconds later, I heard a snap, and Greg flew down into view, landing ninja-like in the rocks of a small outcropping. My catch had done nothing because of the low hex, and seeing the loose rope across my lap, my right hand abandoned the useless device, shot out, and pulled the rope taught. Fixing the belay with my left hand, Greg stood. “My ankles might be broken.” He shuffled towards me as he said this, and I wondered how one would walk in that sort of condition. Or how we’d rappel. Or all that approach, with the fire swamp and creek crossings to manage. How could we get out? It’s one thing to be committed to the rock, but another altogether to be so deep and so deeply screwed. But he stood there, checking his ankles. And aside from one sore ankle, he was fine. To boot, he took thirty seconds, then climbed right back up the thing that had just bucked him off. Run out, over a big, exposed face, he shut down his fear and channeled the adrenaline of the moment into a lead that I nearly fell on while following. Super impressive work, when only a minute prior I’d been wondering about cell service and rescue plans. And such are the moments upon which difficult mountain endeavors hinge–if Greg had wanted to bail, I’d have been with him. Bummed, but understanding the reasons. 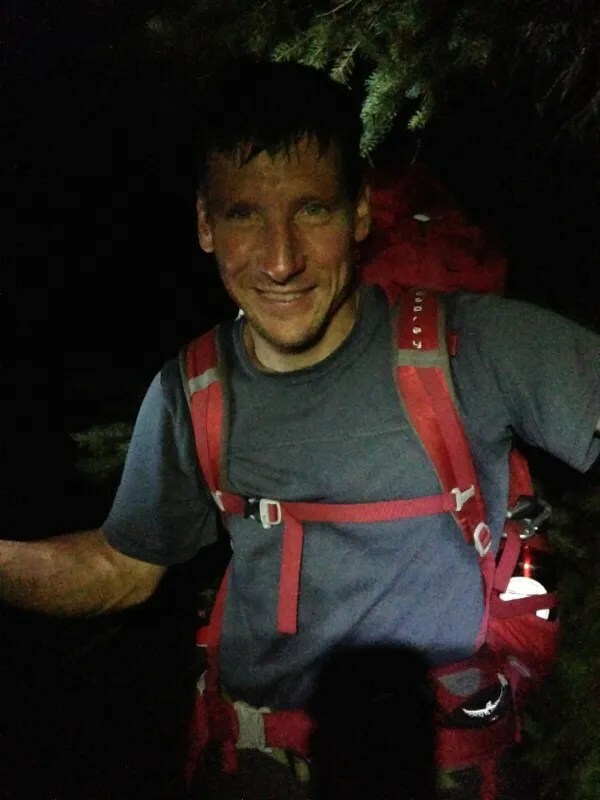 It takes so very little for things to go so very wrong in the remote places we frequent–so my conclusion is that Greg has massive, brass balls to deck on a lead fall from the mountain falling apart and keep pushing up. Not only do I owe all the leads to him, and the fact that we made it, but that courage to push through when shook. Truly an honor to climb with such a strong man of the hills. The next two pitches breezed by. I knew I was a ways up, but it didn’t matter–right there, right then. Nothing else. So far out of what I’d say is my element, but so at home in the familiar bubble of concentration that comes from ignoring the jeer squad of detracting worries. Stacking ropes atop our fifth pitch. Greg, on the last pitch (which we scrambled, then single rapped for the descent). With some last scrambling, we were on the summit. 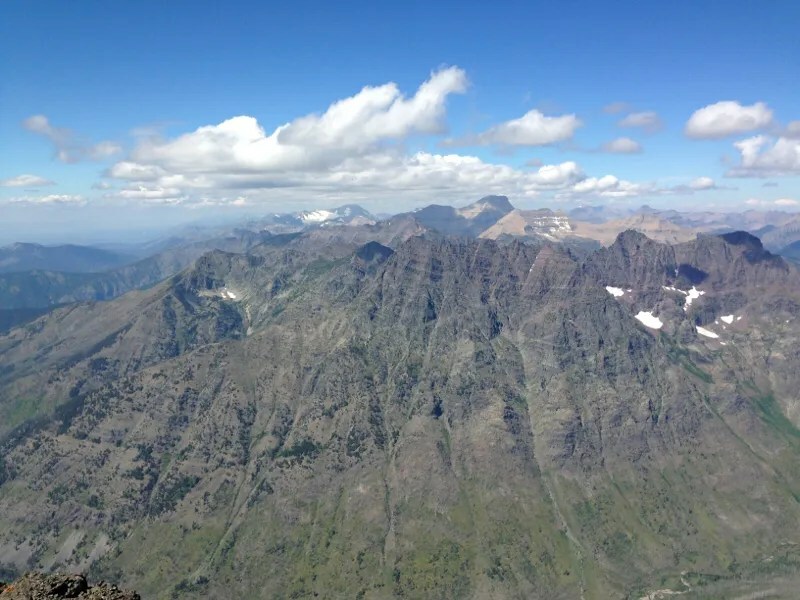 Looking north: Doody and the Cloudcroft, Eaglehead and Pinchot, Stimson, and Jackson in the back left. Looking east: Flinsch, Red, Rising Wolf, Rockwell, Appistoki, Henry, Ellsworth in back. Lone Walker, Caper, Battlement, Vigil in front. Our campsite was left of the large patch of snow in the foreground. 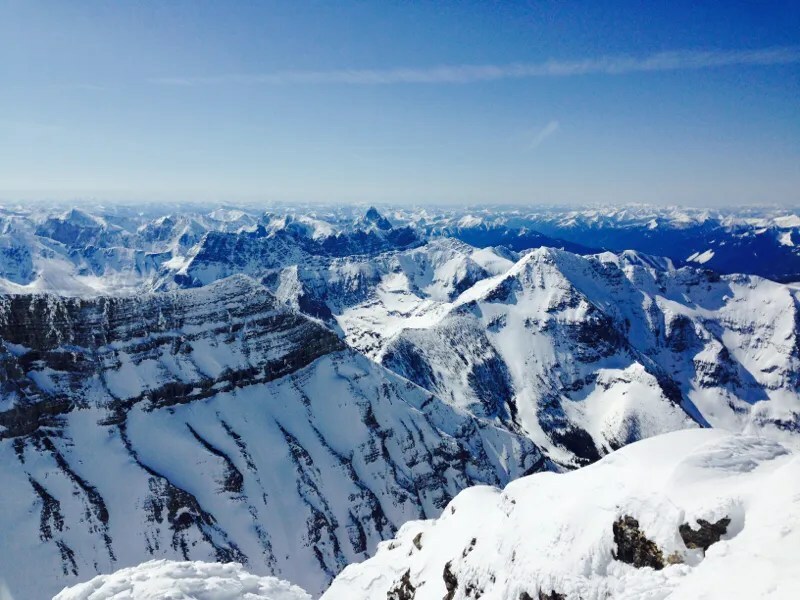 Typically, the summit is a place of rest, and somewhat ease–the route is known, and unless a different route is to be descended, the obstacles that are really going to be issues are already there. However, as Greg’s drop had proved, it only takes a ledge with no moss on it to turn things on their head. I felt exposed, raw, way far gone from the comforts and capabilities of the world. It was exhilarating to know that I could climb up such stuff, following Greg’s lead. Freedom, for me, comes with the swelling sense of possibility when my boundaries are successfully pushed. What a way to get into multi pitch trad–and if I could make this follow, what of the future? What else could I do? How many other great climbs had just been opened, the possibility now a crack in what had been a blank wall of no? 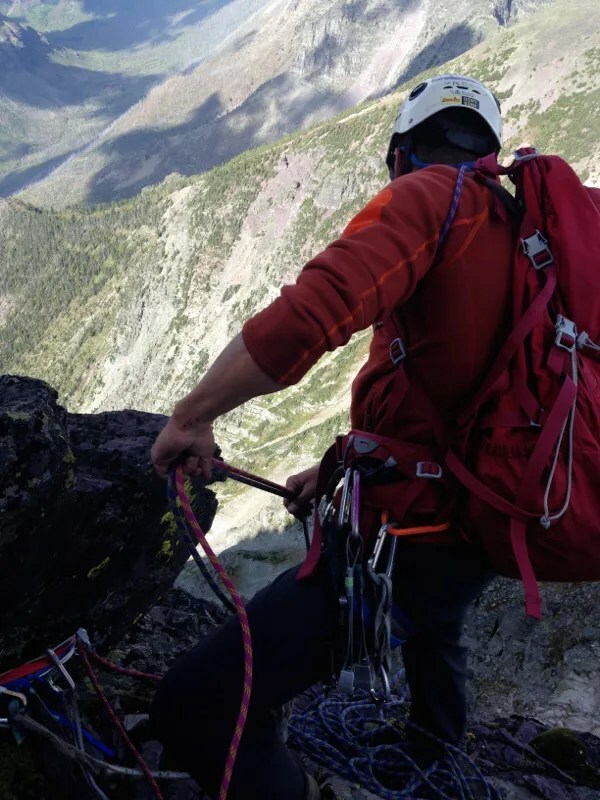 That excitement whirred alongside the fear of where we were, and as we started down, I thought that the rappels might be simple. Of course, they weren’t. All the blocks and lack of verticality that kept me happy on the climb made for really sketchy raps. Not only was it hard to find some of the rap stations, but the blocks meant that the rope threaded over multiple edges, see sawing back and forth with every weight and unweight as I moved over further edges. Greg would throw the rope down, get set, and head off to untangle the ends from the rocks. I’d be there, waiting. Nobody to talk to, nothing to do but swallow the fear and head down. 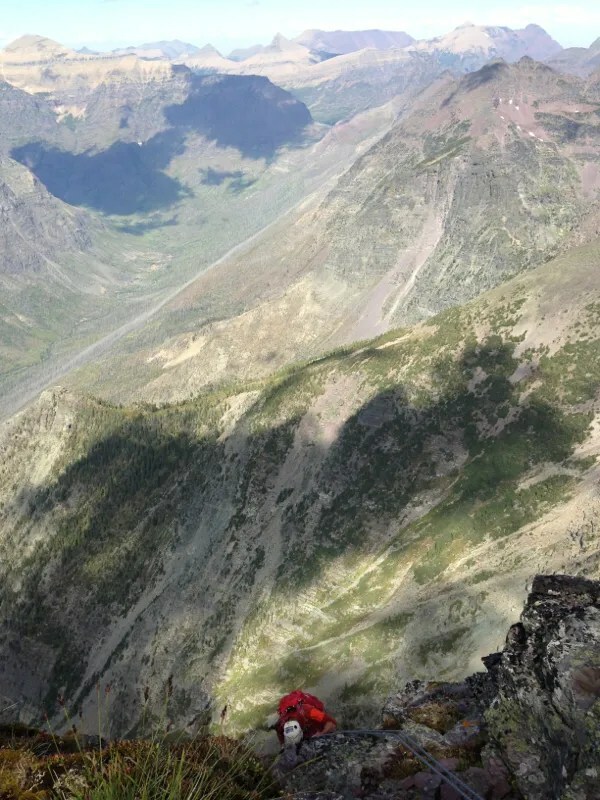 I actually took ten deep breaths above the third pitch–but it didn’t do much to cut the most constant wave of fear I’ve felt in the mountains in quite a while. Greg looks up from the Great Notch as I prepare for the last double rappel. It’s been a while since I’ve been that excited to be back on chossy, steep scrambling. The rappels were exciting, terrifying, and over. 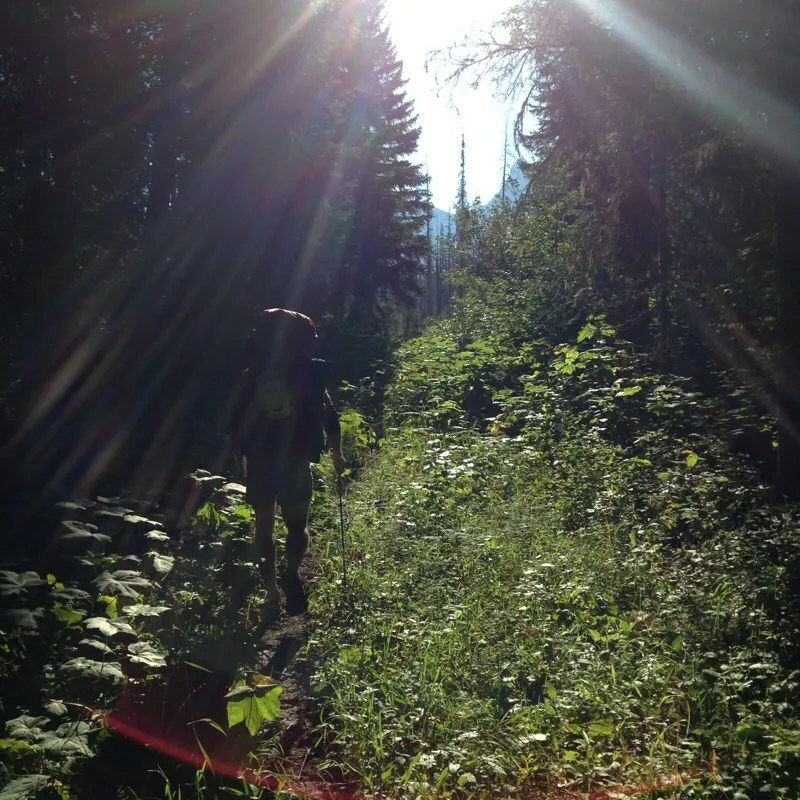 Grabbing our stuff, we started the race against the darkness to descend the 5000ft from the Notch to Coal Creek. I don’t think it right to call a mountain a canvas, because the marks we make on them aren’t important to see in the big picture. 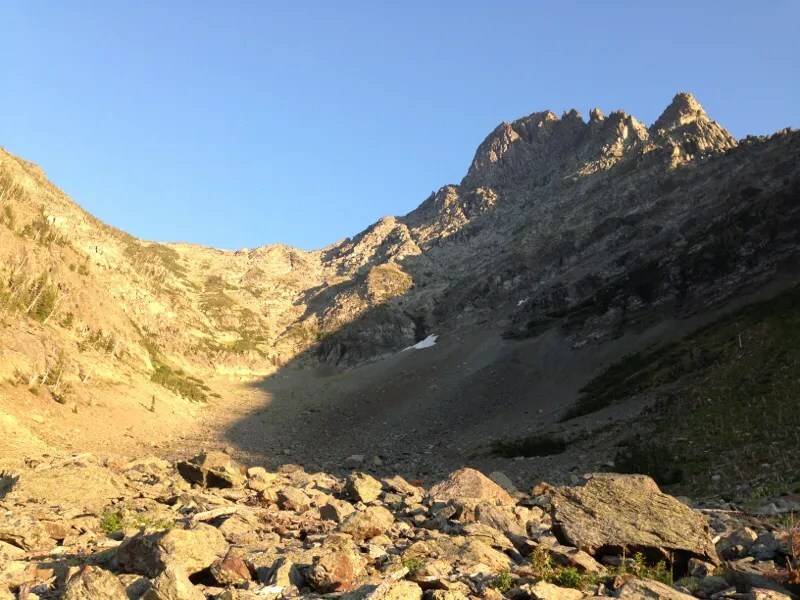 Arena seems better, because when we go to these places, it is the climber that comes home so changed–the possibility that I keep coming back to, the ability to fire ourselves in their crucible and come away that much more clean, simple, pure. Of course, we lost the race. Darkness crept over us as were nearing the creek. Stumbling through headlamp lit marsh grass, I watched Greg fall into a grassy hole between two logs. He then fell in again, and his headlamp beam completely disappeared. Once at the creek, we used map and GPS to arrive at the not-so-significant conclusion that we were perhaps a mile upstream of where we’d crossed before. Any excitement I had evaporated. Greg, however, was totally into it. Twisted ankle and all, he waded in. And quickly, everything changed. As the current pulled into an pool much deeper than our hip belts, we got on a log. In the dark, with nothing to guide us, we’d found the route that had eluded us in broad daylight before. No fire swamp. No doom by devil’s club. Just a gentle flow, to a log over the deep part, and we were on the hillside. It was another stroke of brilliant luck when we needed it most. An hour or so later, it was near 11:30pm. 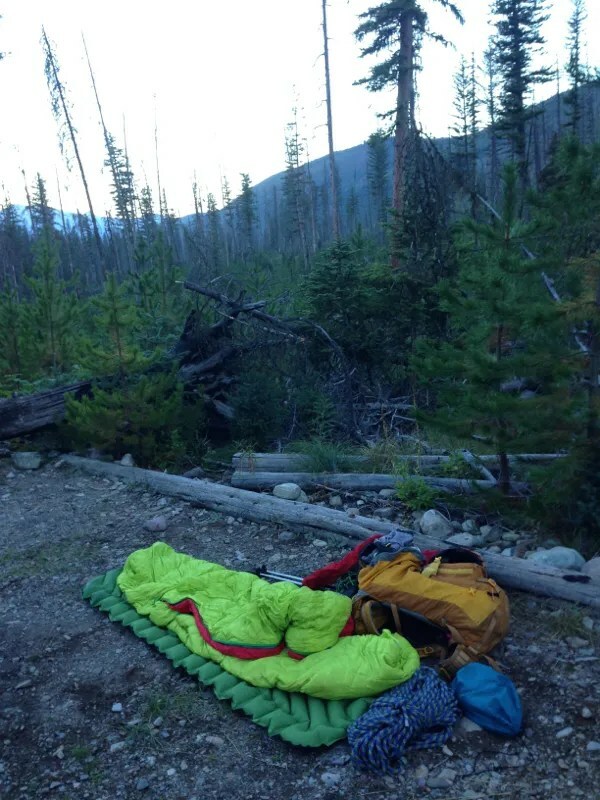 We were almost to the Coal Creek campground, and with another major river crossing and six miles, sleeping was the better part of valor. We grabbed a spot in the name of tiredness, and conked right out. Rope makes for a stiff pillow. The morning dawned overcast and dewy. My bag had water droplets all over it, and the biggest saving grace was the mix of cheese, powdered milk, and instant potatoes at the bottom of my food bag. Breakfast turned my morning around. It was time to head out. 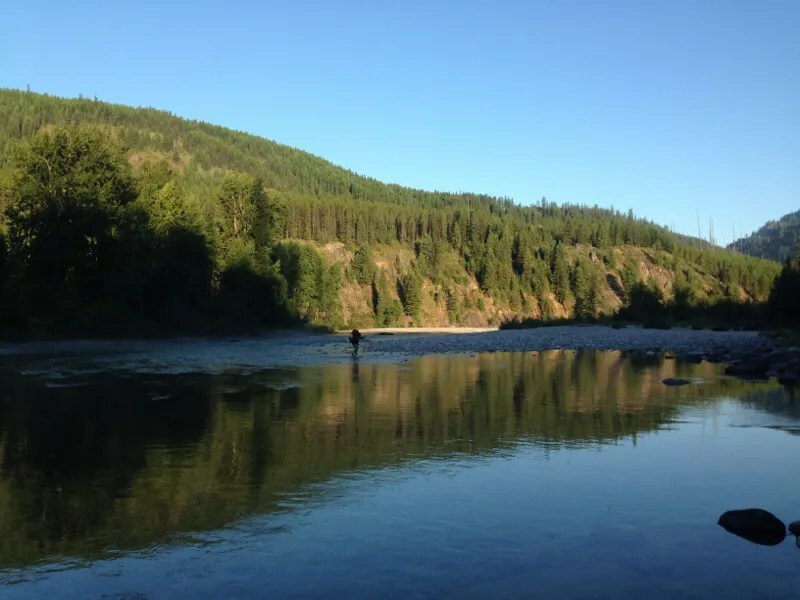 Greg crosses the Middle Fork. Huge thanks to Greg for inviting, leading, and doing it all with panache. And thanks to Dave for letting me skip out on the fence–I went back and finished it later in the week. Hey great story! i was wondering where you parked and started from before crossing the river and heading towards coal creek campgorund, thanks! Glad you dug the story; thanks for tuning in. The trailhead is the standard start to cross to the boundary trail: a bit before the Lake Stanton trailhead, on the west side of Highway 2 is a grass parking lot of sorts above the road embankment. All summer long, it will have cars in it for other folks backpacking in that area. Park, making sure to keep the stock ramp access clear, then head directly across the road to catch the trail that crosses the railroad tracks and drops down to the river.